As a child, Hong Kong seemed to be a mythical place. It was British and it was Chinese – exotic and strangely familiar. Like so many children of the 70s and 80s in Australia, for whom a trip to a Chinese restaurant was both a great pleasure and an eye-opening multicultural experience in a then far-less Asian Sydney, I was enthusiastic for all things Chinese. Hong Kong was also the home of Bruce Lee, and though I wasn’t exactly a slavish fan as a child, he was seen as such a heroic persona that it was hard not to charmed even by the idea of Kung-fu itself. My uncle lived in Singapore for some time and though I never visited him there, his visits to Australia were for a while accompanied by Asian artefacts – small ceremonial dragon dolls, brass coasters in the shape of Chinese characters, a wall-scroll of a traditional landscape. In a time when Australia was only beginning to see itself as a part of its Asian context, it felt exciting to live in a place surrounded by such exotic nations and cultures. Later, in my twenties, when I was dating someone from Hong Kong, my curiosity and interest was re-awakened, but still only lived vicariously through films such as The World of Suzie Wong, In the Mood for Love and its sequel, 2046. Despite this interest, while I have visited Singapore a number of times en route to other places, I’ve only been to Hong Kong once, in 2009, at which time I went on a great photographic spree. While it might have lost some of its old Asia appeal, it is a stunning and exciting place, with a mix of gorgeous geography and eye-catching modernity. Hong Kong harbour is a marvel, irrespective of the rather tacky light and sound show which struts its stuff every evening. This photograph has long been a favourite as much for its geometry as for its subject matter. 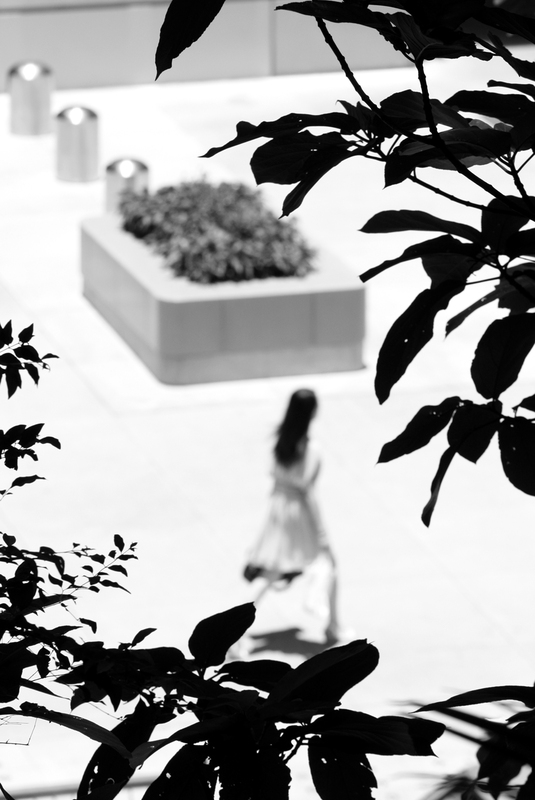 The leaves framing the image remind me of floral patterns on a loud shirt, reduced here to monochrome, and obscures the walking lady just enough to make it feel as though the photo is taken from a hidden vantage point. There is something magnificently languid and diaphanous about the woman – she seems to have an impossibly long stride, without appearing awkward. The sun is also directly overhead, so that all shadows fall immediately under their casters. It was a beautiful, clear and not too humid day; the air scrubbed and freshened by a typhoon which had lashed the place for two days previously. After a more than a month in sticky south-east Asia beforehand, I hadn’t expected to find such relief in this most splendid of cities.